What’s out there in terms of air compressor accessories for your new compressor? This page is here to describe what air compressor accessories are available, and to determine if a particular compressor accessory that may not have come with your air compressor is one that you want or need. Some manufacturers show as standard compressor accessories that other firms list as extra. Some of these add-ons you really must have, some you might not need for your particular compressor. A range of compressor accessories are listed in alphabetical order. Access points to your compressor’s innards aren’t necessarily an accessory, but are sure necessary. if the compressor you have selected is an enclosed (shrouded) unit ensure that you understand how to access all the components that require regular maintenance, for ease of change out. It doesn’t hurt to have the compressor dealer demonstrate the process for you as well. 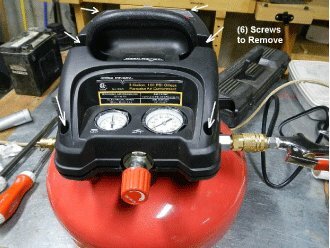 In the case of the smaller DIY type air compressors, as shown below, removing the shroud that covers the user serviceable parts is often a challenge. Often your manual will show how to remove the shroud. If not, maybe before you buy you ask the sales person at the store to show you? You will have to get into the guts of the compressor eventually. Smaller compressors have a plastic shroud preventing owners from getting to parts that may need repair easily. If you are building an enclosure for your air compressor in order to reduce compressor-generated sound levels or to prevent unauthorized access to it, make sure you install adequately sized access doors for your regular and emergency maintenance. The compressor will generate heat. Depending on the size of your air compressor, it could generate quite a lot of heat. An aftercooler, integrated with the compressor, will solve some of those heat issues by cooling the hot compressed air (and ridding it of much of the water load) before that air gets to your tools and equipment. Many pages on how compressors generate water and the problems that water creates can be found linked from the sitemap page. Aftercoolers can be electrically operated, water driven, or simply be a dwell tank in which the compressed air can sit and cool before use. If you feel an air compressor after cooler may be beneficial, see the page on water solutions linked from the sitemap or troubleshooting pages. An auto drain is a compressor tank accessory that is, in my opinion, a “must have” for air compressors that are used regularly. Here is much more information on auto drains. For belt driven air compressors, a slipping drive belt will cost you considerably in lost energy to drive the compressor motor, as much of the energy used to cycle the belt will be lost as the belt slides through rather than turns the compressor drive sheave. Slipping belts create all sorts of sounds, including squeals. Vibration from a too loose belt can loosen fastenings and fittings on the compressor. An automatic belt tensioner will help alleviate that concern and improve the overall efficiency of your unit. If your belt-driven compressor is being used to generate income, then an automatic belt tensioner can save you money! Air ends are the drive parts of the rotary screw and vane compressors that contain bushings or bearings that allow the components that compressor the air to rotate at high speed. In doing your research before you buy, you’ll note that there is a real concern about the longevity of the bearings at the air-end of rotary screw and vane compressors. This issue of “air end reliability” is referred to so frequently in compressor literature and on compressor manufacturer’s websites, that you want to be sure to discuss air-end feature of their units with each manufacturer. How do they address the air end reliability of their compressors? Paying extra at the beginning for heavy duty air ends, if they are available, may save lost production and reduce compressor down time in the future. They may be a wise investment. It is hard to believe that a company would sell a compressor with a belt drive, and not ensure that there were enough belt guards to meet reasonable safety requirements. Do yourself a favor and make sure that if the compressor you select is belt driven, that the belt drive is shielded. If you can get to the belt while it’s moving, you can expect that sometime, someone else will, with potentially serious results. The belt guard can be seen on the back of this Air Force air compressor. A pretty broad topic, compressor control panels. If there is a control panel with your new compressor, you’ll want to know exactly what is controlled by that compressor panel. Is the compressor variable speed to react to downstream demand? Can the panel control more than one compressor so that a back-up unit only fires up on demand? Does the panel display operating temperature, with alarms if there’s a condition on the compressor that’s a cause for concern? Will it ‘flag’ regular maintenance? Is there control logic in the panel, and if so, what PLC is used? Is the PLC language one that you can learn, have a technician modify or correct, or is it unique to the vendor? When there is a fault on the compressor (and yes, eventually there will be) what information does the panel provide to help you diagnose and fix that fault? I can’t possibly list every item a compressor control panel could oversee. You need to spend time with your compressor vendor to be sure you understand the details of any control panel on your compressor. Some compressor manufacturers offer “packages” with their air compressor, including aftercooler and air dryers. To better understand why compressed air dryers are needed, here is information on what causes compressor water, and if you follow the links, information on various dryers for compressed air. It is often worthwhile to get a whole package from a specific compressor vendor (compressor and dryer) as a single source for a system, and equally important in my view, a single source for warranty and maintenance as time goes on and things start to fail. For example, is the type of compressor drive important to you? You may not have a choice about compressor drive type when it comes to the compressor you have selected, as a variety of drives may not be available in your choice of compressor size or model. Consider that the compressor might have a ‘V’ belt drive, a variable speed drive, or be direct driven. Consider the up-front cost of each drive type as compared to the long term maintenance costs to keep that style of air compressor running. Which best suits? For purposes of noise attenuation, security, appearance, safety, running in adverse environments, etc. etc., a compressor enclosure, whether acquired from the compressor supplier, or custom built at your plant, is something you likely will want to have. There are a variety of filters used in air compressing and compressors. There is a filter to clean the air entering the compressor intake. There should be a auto-draining compressed air filter at the receiver discharge line to the plant. The oil used in the compression of air will need to be filtered. Determine up front what types of filters comes with your compressor, and what filtration you will have to add after the fact. How do you change each of the filters? What is the length of time between filter changes? Where do you purchase replacement filter elements? What is the skill level required in changing each type of filter? What are the acquisition costs for each filter times the frequency of change each year? All of these questions should be considered before you make your compressor choice. Most of the regularly scheduled maintenance on your compressor must be performed after a certain run time. A run-time hour meter is very useful for monitoring compressor use, and having one is key to helping ensure that maintenance is carried out at the appropriate intervals. If you compressor doesn’t come equipped with this, make it a point to ask for it. Not all compressor oils are created equally, and using the poorer quality oil may have nasty effects on your compressor maintenance and costs in time to come. How does the maintenance person check the lubrication levels on this compressor? How many different types of lubricating oil does this specific compressor have? Ask the compressor vendor what options you have for lubrication, what their recommendations are, and how stepping outside of their recommendation (perhaps you’re convinced that another synthetic oil will work better for you) will affect your warranty. Can you drive your truck very far without oil in the engine? Well you can’t expect your compressor to last if it runs while low or out of oil either. 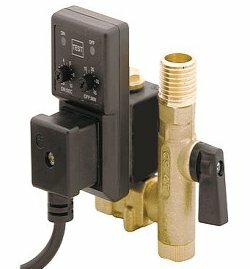 Whether it’s a simple sight glass, right up to a pressure and temperature oil sensor with alarm function, if your compressor contains oil, you’d best make sure you can check it easily. If the compressor you are selecting uses oil in the process of compressing the air (not just for lubrication of moving parts) what system does this model of compressor use to ensure good air / oil separation for the compressed air leaving the compressor? You want to know what user-serviceable parts are part of this system, and how to maintain it. Typically compressor lubricating oil is not good for downstream components, often degrading rubber seals and poly-carbonate air components. Ask about percentage of oil carryover a particular compressor has, how time affects the air / oil separation efficiency, and how best, with that type of air compressor, to keep compressor lubricating oil out of your air lines. If your need is for a portable compressor, think about how you’ll move it around. Carrying is OK for a small HP unit, as they might only weigh 40-50 pounds. As your CFM needs increase, so does the horse power, and larger HP means more weight. Consider a wheelbarrow type construction for slightly larger compressors. Or even a fork insert area whereby you could lift the unit with a hand or powered fork truck should it be necessary to move the compressor. Portable tow-behind air compressors have portability built in. Maintaining the trailer part of that compressor is something you want to know about up front. If your air compressor needs to be moved, how will you do it? A vibration monitor guards your compressor twenty-four hours a day to send an alarm should the compressor vibrate excessively. Excessive vibration is a symptom of major failure in the system and you will want to know about it immediately if compressor vibration starts to occur. How will you? Reputable compressor manufacturers aren’t afraid to back up their products with good, reliable warranties. You should check with each potential vendor to determine what length their warranties are, what all is covered, what is excluded, and what conditions would render the warranty void. If there are too many reasons why a particular compressor manufacturer’s warranty would not be honored by them, well, it’s like having no warranty at all, isn’t it? Compressors are electro-mechanical devices. Some will fail within their warranty period due to poor manufacturing practices or lousy quality parts. Others will not fail after years of use. That all air compressors will fail is not the question, since every compressor will fail eventually. When yours does, who fixes it? I hope that the list of more compressor accessories isn’t too overwhelming. Certainly, it is a good idea to consider everything when acquiring a new compressor that may be worth north of tens-of-thousands of dollars. Take your time and investigate compressor accessories thoroughly. Years after you buy your compressor, having done so will continue paying dividends.